In the summer of 2011, the electorate in Troy, Michigan (a suburb of Detroit) had a ballot measure in front of them: increase taxes to fund the library or close it down entirely. This was not he first time that library funding was up for vote, and two previous ballots were unsuccessful, largely due to the strength of Citizens United Troy, which was supporting the ‘no’ vote. 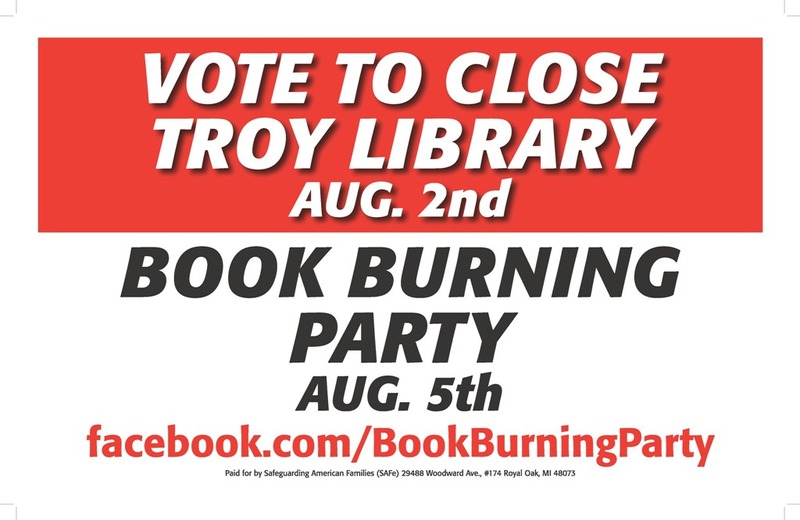 Things did not look good for Troy Public Library. In the months leading up to the August 2nd vote, lawn signs mysteriously started appearing around town, just like the one pictured above. The signs were credited to Safeguarding American Families, some kind of political group. What made this new group even more odd was that Troy Public Library had nothing to do with the group or the signs. Needless to say, many were confused and others were outraged. 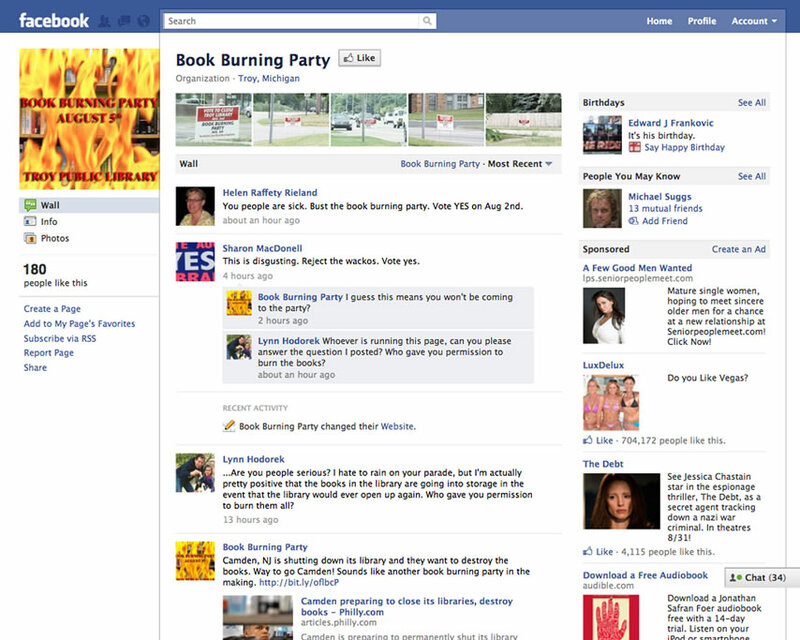 Unsurprisingly, librarians were among those that found the idea (even as a joke) of a book burning distasteful. Shortly thereafter, social media pages on Facebook and Twitter began to spring up. A want ad appeared in the Troy Times appeared “clowns and ice cream vendors for the book burning party”2. At some point – the history isn’t clear on exactly when – the real players behind the book burning campaign revealed themselves to be the ad firm Leo Burnett/Arc Worldwide Detroit. Days before the vote, the ad agency changed the messaging, focusing instead on the idea that voting against funding the library was like burning books. Additionally, the agency pushed other kinds of marketing into the Troy area on election day, including mobile truck ads3. In the end, the voters of Troy, Michigan voted to fund the libraries (12246 Yes to 8799 No), and Leo Burnett went on to win many prestigious marketing awards for the campaign, including an Effie (a big deal in the ad world). It is a remarkable narrative of reverse psychology marketing (which the agency conveniently turned into a video, below), although some questions remain. Why would a large ad agency intervene on behalf of a little public library, especially if the library itself was not the client? How much of an impact did the benevolent Leo Burnett Detroit actually have? Nick Parish writes at length about the forces at play in this story, which includes interviews with people involved, and some speculation about how marketing awards may have been the great motivator behind the whole thing. Definitely worth a read. I particularly liked the detail of how the librarians at Troy Public Library did the research to figure out who was behind the mysterious Safeguarding American Families. That leaves just one more question: did the ends justify the means?